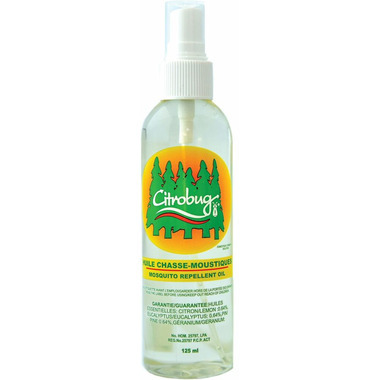 Citrobug Mosquito Repellent Oil is made with essential oils (lemon, camphor, geranium, eucalyptus and pine). Directions for Use: Apply a thin film to exposed skin, avoiding eyes, mouth, wounds, and sensitive, irritated or sunburned skin. To apply to face, spray a small amount on hands and rub on face. Apply sparingly, only when necessary, and not under clothing. Always supervise applications on children and do not apply to the hands of young children. After returning indoors, wash treated skin and contaminated clothing with soap and water. Reapply at 2 hour intervals only if exposure to mosquitos continues. DO NOT EXCEED 2 APPLICATIONS PER DAY. Precautions: KEEP OUT OF REACH OF CHILDREN. DO NOT USE ON CHILDREN, 2 YEARS OLD AND LESS. For external use only. May cause skin reactions on sensitive individuals. Discontinue use if signs of irritation or rash appear. Can be used safely when used according to the label directions. I just used this on my son while camping and he was bit so bad, he had welts all over him. It was not effective against mosquitoes at all. I found this to be ineffective and very greasy,plus the package is of poor quality, it leaks a lot. My husband and daughter got bitten many times during their 1h while walk in a small forest here in Montreal . I wouldn't even think of bringing this in the wilderness, where there are many more mosquitoes than in the city. Was in Costa Rica's tropical rainforest where it was requested that we use bio-degradable, organic repellent. Worked great as far as we are concerned and smelled lovely too. Please do not use this bug spray on pets!!!! It contains citrus essential oils, camphor, pine oil and geranium oil, all of which are highly toxic to dogs and cats. This product is a pretty good mosquito repellant for humans (though I find in lots of places in Canada, when the mosquito season starts, nothing seems to help a lot), please, please don't use it on your pets. Even if you just use it on their collar or hankerchief, just breathing in the vapours is highly dangerous to them. There are some oils that are not toxic to your pets and may help with mosquitoes and ticks but not this product. It kept the mosquito's away!! Myself and my husband didn't have any mosquito bites after using this. It was a little greasy at first, but absorbed into the skin. The smell is nice and not over powering. Love this stuff, it's great for my super sensitive skin and really works to keep away the mosquitos. It must be reapplied a few times but as it is non-toxic that is no issue! Very greasy! Doesn't work as well as other natural spray so have use. Smells great. I want it to work so badly because I love natural products but when it comes down to it we are covered in mosquito bites. I bought this to try for my dogs and grandson since I did not want to use deet on them. I found it effective. Strong smelling but I did not find the smell unpleasant. I would buy it again. Went to the Caymans and sprayed as directed. Within a couple of minutes all of us got bitten. At dinner I got 10 bites in various places (about an hour dinner). It's greasy, smells like citronella candles but doesn't work. It has oil of lemon and eucalyptus but I was in a rush and misread the label when I purchased it. It's oil of lemon eucalyptus that works. Lemon oil is not the same.